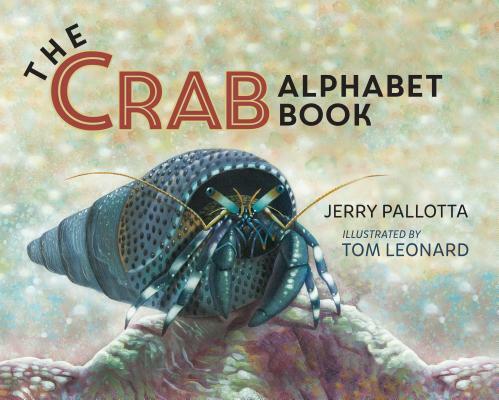 With his signature humor and amazing facts, best-selling author Jerry Pallotta offers a decapod for every letter of the alphabet. Meet dozens of crustaceans--and a few bonus animals--with engaging text and a laugh-out-loud narrative, from A (Arrow Crab) to E (exoskeleton) to I (Imocaris, a kind of fossil scientists believe to be the first crab on earth) to Z (Zebra Hermit Crabs, which have a hard covering on their legs and claws, but their body is soft). Readers of all ages will be entertained (and learning!) with every page turn. Jerry Pallotta is an award-winning author of children's alphabet books and imaginative fiction, including The Sea Mammal Alphabet Book, Butterfly Counting and Colors, The Construction Alphabet Book, and The Icky Bug Alphabet Book. Jerry lives in Boston, Massachusetts. Who knew there were so many kinds of crabs? At least 26, in fact. Pallotta is known for his many alphabet books, ringing the abecedarian changes on such subjects as construction equipment, victory gardens, "icky bugs," herbs and spices, and dinosaurs, to name just a few. Here, he brushes the sand off of crabs from A to Z. Readers will learn that crabs are decapods, a term that means 10 feet, with crabs qualifying by having eight legs and two claws. The subject itself is intriguing, and paired with Leonard's realistic acrylic illustrations, the result is striking. Many readers would know a few types, such as fiddler, blue, (zebra) hermit, and king, but most will likely be a surprise: Christmas Island, Halloween, mitten, ghost, velvet, xeno, and yeti. Kids will giggle at the ninja crab and the pom pom crab (which "holds venomous anemones in its claws"). The book is nicely designed, with a capital and lowercase letter in the top corner of each page and the illustration framed with a white border. Humorous notes ("please don't call a grumpy teacher a crabby teacher—it's not nice!") and informational tidbits ("If a crab loses a claw or a leg, it grows back") appear in faux hand-lettered callout boxes throughout. The Sea Mammal Alphabet Book publishes simultaneously, struggling a bit to meet the ABC format and lacking the impressive unity of this title. Informative and entertaining; good for ocean units, displays, or just plain browsing. The crabs want readers to know that they've had it with books about cute and fluffy critters, and they're demanding their own book. This beautifully illustrated alphabet book should make them happy, as fullpage spreads offer detailed images and short informational paragraphs about decapods ranging from Arrow Crabs through to their Zebra Hermit cousins. Each page brings a fresh, up-close painting of a new variety, with the only slightly fudged offering being "I for Imocaris," a crab-like fossil from several million years ago (and be sure to check out the Ninja and Halloween varieties). There's a considerable amount of factual information packed into the relatively brief text passages, and occasional cheeky messages directly from the crabs spice things up. Young readers should be able to readily understand the content, and they'll certainly enjoy looking at the detailed pictures. Whether for group or individual perusal, school or public library, this makes for a handsome and intriguing addition to the abecedary canon. A collection of crabs, “tired of books about cute penguins, proud tigers, colorful butterflies, and other favorite animals,” help to narrate this quirky ABC book. Leonard illustrates in naturalistic art, while Pallotta, the author of many abecedarians, introduces each crab in upbeat, fact-filled paragraphs: “J is for Japanese Spider Crab.... Its legs can be more than six feet long. Wow!” Additional facts (“And now a message from the crabs”) are offset from the main text: “Most crabs have eyes like periscopes.” While many of the crabs’ missives are more irreverent than edifying (“Please don’t call a grumpy teacher a crabby teacher—it’s not nice!”), readers will enjoy learning about the peculiar-looking and often uniquely named (Halloween crab, ghost crab, ninja crab) decapods.